We just finished adding the finishing touches to this beautiful remodeled lake cottage just 10 minutes from Hayward. This lake cottage has all that you would expect: full kitchen, new and modern appliances, all new furniture and central air conditioning. Plus a pretty sandy beach where the young ones can dig in the sand. And a fire pit right on the beach for your exclusive use. Enjoy breathtaking views of lac court Oreilles from our large patio, or large living room, or master bedroom, or out den area. All have large multiple windows for you to watch and see what’s going on outside. See spectacular sunsets and interesting wildlife. Last year there was a pair of bald eagles with us most of the year, and we expect then to return. You can watch then perched high atop a big white pine tree and then see them swoon down to pick up fish from the lake. In the early morning from our property you can also see loons, all kinds of ducks and geese, and occasionally even a bear. Lac Courte Oreilles is over 8 miles long and at over 5000 acres is the largest natural lake in the county and is well known for excellent fishing, sailing, exploring and water sports. The cabin is nicely located close to casinos, golf courses and day trips to surrounding communities that will make your stay even more interesting. The fun resort town of Hayward with its many restaurants, shops and activities is only about 10 minutes away. Sleeping arrangements in the cottage: bedroom 1 has a queen bed, bedroom 2 has a queen bed, bedroom 3 has a queen bed and two bunk beds (with a total of 4 twin mattresses). I grew up on a lake in north central Wisconsin about 40 miles south of Hayward. Some of my fondest memories are from the lakes and woods of northern Wisconsin. We bought this cabin to be a family retreat and to make some family memories and use it when we can but with 3 kids that are active in sports we decided to rent it out so other families can make lasting memories. Please enjoy our lake house and take good care of it. If you need anything during your stay I'm just a phone call away. If your renting my lake house please take care of it. I've vacationed in the Hayward area for many, many years. Plus this cottage is on possibly the largest and nicest lake in all of Northwest Wisconsin. I like to hang out with my friends in the cottage or on the beach. Also really enjoy fishing and cruising around the lake on a pontoon exploring and seeing the sites. In the evening it’s fun to go over to the Waterfront Restaurant for dinner and drinks and to meet new people from all over. Also enjoy having a bonfire on the beach as the sun is setting. Canoe, some flotation devices etc. It's hard to find a flat sandy beach on the lake in Hayward. This cabin has it. Great for kids and adults. Bring your boat and tie it up on our private dock or rent one on the lake. Winter has a lot of great activities as well, ice fish, snowmobile, ATV this area has it all. This is our second year and was another great stay!! We missed the snow but knew it was likely with our dates this year. We will definetly book again. Great view and great space for large family. Loved our stay - thanks for allowing dogs - they had a blast, too. I'm so glad you, and your dogs, enjoyed your stay with us. I can't imagine a vacation without our four-legged family member along either. Please come back again soon. Family and dog friendly cabin! The only complaint I have is that it would have been nice to know ahead of time that the water is so full of iron! We had to go buy bottled water because it tasted and smelled so bad! Otherwise, lovely home with lots of room! Comfy beds, beautiful view and wonderful patio! Thank you for sharing! I'm sorry the water didn't meet your expectations. The Hayward area does have some iron in it but I've never noticed it myself or heard any complaints from guests before on a strong odor or taste. We do provide a Britta water pitcher in the cupboard for guests to use. In addition as a part of our licensing the county health department tests the water yearly (it was just tested again last month) so the water is definitely safe to consume. Open floor plan, warm cozy well stocked kitchen lots of pleasant seating good relaxing wk end for sisters yaya. HI Susan, sorry to hear the weather didn't cooperate for your stay but I'm glad to hear you still enjoyed yourself. We would love to have you and your family back to LCO any time! My husband and I really enjoyed our stay at the house. It's very spacious, clean and well kept. The property manager was very helpful when we arrived. The weather wasn't the best during our stay but Kevin managed to catch a few northerns anyway. We always make a point to visit the local candy shoppe when we go to town, too. It's a must see! Mother nature did a little damage to the trail down to the lake but they will be fixing it. There was another way to get to the lake so that wasn't a problem. The beach area and piers are very nice. The only thing I would suggest would be to consider having a washer and dryer on site since you have to bring all of your own towels (bath, beach and kitchen), especially if you are staying for a week. If we had any questions or concerns Jon would get back to us almost immediately. He's great to work with!! All in all we had a great time at Sandy's Beach House spending time with family and relaxing!! We'll be coming back next year!!! Thanks for the awesome review. I'm so glad you enjoyed your stay and we are looking forward to hosting you again soon. The walking path to the lake has been fixed. We've had so much rain this summer it's been a challenge to keep up with but its good to go now. Sandy's is a large, comfortable, well equipped, attractive, lake home, a short drive from Hayward. Really not a great deal I can add to the other favorable reviews. 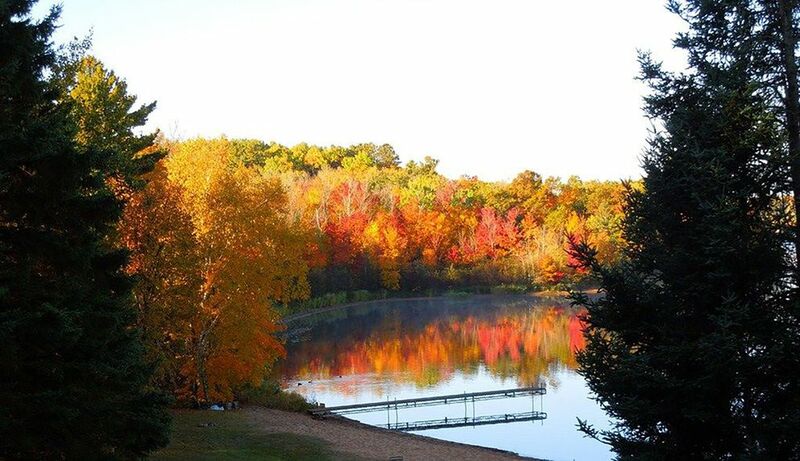 It is simply a first class destination for those seeking a quality week in the north woods. Space was not an issue for 6 adults and 4 toddlers. If the sand beach isn't the best in the Hayward, it's close, although it is a bit of a hike down hill to reach it. Comes with a private pier and electrical hook-up, for those who need to recharge their trolling motors. We took cards, games, dice, etc but unused, as we found ourselves sitting around the patio fire nightly. This was our second stay at Sandy's and we look forward to a third. Thanks so much for the great review and for being a great guest. We would love to have you back any time. I hope you got to experience a bit of the fall colors that are just starting to pop out. I agree with you that LCO is certainly a fun place to go but just for clarification to other guests, LCO Casino is 6 plus miles away, not right around the corner. Sandy's is a pretty private cabin 12 miles outside of Hayward. Our cabin is located on Lac Courte Oreilles lake just outside of Hayward, WI. Lac Courte Oreilles lake is a 5139 acre lake located in Sawyer County. It has a maximum depth of 90 feet. There are several nice public boat landings near the cabin to launch your boat and we offer you a private dock to use during your stay with us. Fish include Musky, Panfish, Largemouth Bass, Smallmouth Bass, Northern Pike and Walleye. The lake's water clarity is very clear. Also available on the lake are pontoon rentals, gas for your boat and dining.